The Best Home Espresso Machine reviews with semi-automatic functions. If you’re going to take the time required to research; to scroll through endless lists and model specifications; to go through the hassle and spend the money in order to purchase your very own Home Espresso Machine, then I’m in no doubt, you want it to produce the best quality results and as much as can be expected possible – effortlessly. Well that’s why we’ve put together this simple, user friendly, on point Best Espresso Maker reviews, including some of the most respected names in the Espresso business. Here is a comprehensive chart of the best on the market. Check it out. But first, maybe you’re wondering what a Semi-Automatic Espresso Machine actually is? But specifically an Espresso Machine brews coffee by forcing pressurised water, which is close to boiling temperature through a ‘puck’ of ground coffee (or if applicable an E.S.E – easy serving espresso pod) and filter in order to produce a thick, concentrated form of coffee called espresso. What distinguishes a Semi-Automatic Machine? A Semi-Automatic Machine contains an automated pump as well as automated temperature controls for the boiler. But what makes it ‘Semi-Automatic’? You choose when to turn this pump on and off. Why choose a Semi-Automatic Home Espresso Machine? My Coffee, My Way: I think the most common reason why anyone would choose to purchase their very own Home Coffee Machine is simply so that they can experience the quality coffee they love on a day to day basis; in the comfort of their own home, quickly and just how they like. If Entertaining: The Semi-Automatic Home Espresso Machine is ideal for small office space environments and perfect for entertaining guests. Your Home Espresso Machine will perfectly compliment any occasion or gathering and always be a great talking point. At the push of a button: The Semi-Automatic is manufactured with people’s hectic, on-the-go lifestyles in mind – and when it’s as simple and easy to use as touching a button for a great quality result that would compete with anything you could buy out and about, why wouldn’t you? Here are our best Semi-Automatic Home Espresso Machine choices. De’Longhi is a well known authentic Italian model so it’s no surprise that their 15 BAR Espresso and Cappuccino Maker is a #1 Best Seller. With their unique patented dual filter holder, you have the flexibility of using grounded coffee or espresso pods. Its self-priming operation means that getting it all prepared in the morning is nuisance-free, which means one less thing for you to worry about and with a high quality stainless-steel boiler you can rest easy knowing this Espresso Maker has proven durability. 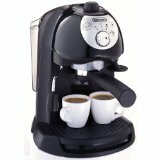 → Get the De’Longhi 15Bar Espresso Maker on Amazon! Separate Thermostats for Water/Steam Pressure. De’Longhi Patented Dual Filter Holder. One thing, which is pretty much a given with a De’Longhi Coffee Maker is that the preparation needed to achieve that authentic Italian flavour is as simple as it comes. The BAR32 is no different so creating made to order espressos and cappuccinos couldn’t be easier. The swivel-jet frother allows you to switch between espresso and latte/cappuccino as you please and gives an impressive professional touch to your creamy froth. The removable water tank, drip tray and stainless-steel boiler facilitates regular hassle-free cleaning, which increases durability to ensure delicious tasting coffee time and time again. The chrome design gives this Espresso Maker a stylish and professional finish that would be very apt in any modern kitchen. And this package includes the Aeroccino Plus milk frother providing you with the option to prepare either hot or cold milk froth into a whipped froth or creamy blend depending on your preference. While claiming to be revolutionary, this machine is clearly made to be as straightforward as they come making great tasting coffee, which is easy to prepare and you might have guessed – offering a wide variety of blends and flavours available with their Nespresso pods, so you can pick and choose. → Get the Nespresso VertuoLine on Amazon! Fast heat-up time (15 seconds). This semi-automatic espresso machine would make a neat, compact feature in your home, built with durable high quality materials to ensure longevity; Gaggia are claiming to combine advanced technology with the more classic look. With one of the most respected names in the espresso industry, Gaggia promises to turn anyone into a ‘barista’ with their high performance product. And to top it off this machine includes a 7-gram measuring scoop and coffee tamper. → Get the Gaggia 14101 Classic Espresso Machine on Amazon! The first thing that strikes you about this Home Espresso Machine is the unique die-cast design. Built with a selector dial providing easy switching between espresso, hot water dispenser and steam options and an important auto-purge/anti-burn function, which automatically adjusts the temperature after steam for optimal espresso extraction, you sense they’ve covered all the bases with this functional show-piece. → Get the Breville 800ESXL on Amazon!